Ah, the delicious flank steak. This cut of steak comes from one of the toughest muscles on the cow, but it has some of the best flavor on the animal. 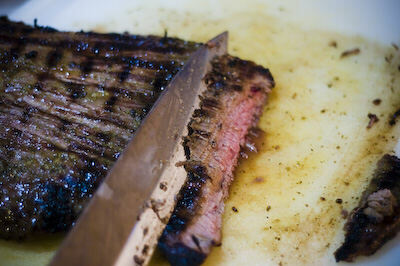 Flank steaks are also great candidates for a long bath in a delicious marinade. Marinade them in some lime, garlic, cilantro and jalapeno and I bet most of those slices won’t even make it to your grilled fajita bar! Sorry, I got a little excited there, back to the point. We all have probably heard, or read on our grilling recipes, that tough muscles like flank steak or tri-tip roast should be sliced thinly against the grain. Most people probably give up on these tough cuts after eating slices that weren’t properly cut against the grain. The concept of slicing against the grain is to shorten the actual muscle fibers so that they are easier to chew. If you slice with the grain, those muscle fibers are really long and tough to chew. Think of a rubber band. If you (for some odd reason) wanted to consume a rubber band, would it be easier to chew up long strands or short? One might argue that you wouldn’t be able to chew even the short bands, but one might also admit you wouldn’t choke as easily as on the longer bands. Nonetheless, you get the point! Still not following me? Well, luckily the Food Lab over at Serious Eats conducted a much more in-depth experiment into slicing meats against the grain. The article is filled with enough photos to make it easy to illustrate the technique, along with enough math and science to please us geeks. Head on over to the article to learn how to slice that tough, but delicious, cut of meat. Then come on back over here for some delicious grilling this weekend using our cilantro lime flank steak recipe! LOVE this hilarious website! The author kept me in stiches AND engaged in perfecting my Tri Tip roast. I’m not a meat lover & have enjoyed BBQ’d T.T. on occasion, so when the hubby voted “Yes” to a (Costco-ugh) Morton’s 2.3# marinaded roast @$7/LB., I said, “Game On, Baby”…! With hand on my bible, I promise I will follow these steps religiously (next time): 1. cut against the grain 2. tone down the rub using only salt/pepper/powdergarlic 3. “honor the thermometer”- my electric oven has a “convection roast” option which I preheated to 425, monitored it against a portable thermometer sitting inside & a meat thermo. stuck into the +/-3″ thick lump o’ love. None of the 3 seemed to jive, so I’m off to buy a new meat stick, portable thermo. & test a batch of brownies tomorrow. We no longer BBQ, due to carcinogens, so I appreciate the author’s description of how to juxtapose the 2 burner concept, searing the roast & moving it to the other side to roast/bake. I’m motivated once again to borrow a BBQ grill! And an RF wifi thermometer. My gratitude to the author AND the sacred cow who’s spirits we honor! And remember to always Kiss the Chef!